In attendance were Fernand, Robert, Joe, John L., Patrick, John D., and John O. As usual, we gathered to enjoy a recently recommended cigar and give our opinion on it by holding a 'group-tasting' following dinner. This herf actually began with a bit of a change in plans. Due to a last minute change in venue, we suddenly found ourselves herfing at Seattle’s private Vertigo Club. A pleasant surprise, indeed, thanks to club member and owner of J&J Cigars, John Ohm. As we’ve done before at The Vertigo Club, this herf’s meal was potluck style – and boy did the guys deliver! We had pasta with a rich meaty marinara sauce, a three meat chili, sautéed shrimp, salad, garlic bread, wine, beers, cake, chocolates, Bourbon, and Scotch. Our selection for this herf was the ultra-limited Tatuaje El Triunfador SODO Corona Especial, chosen to celebrate our 40th herf since The Cohiba Club’s founding back in the spring of ‘07. 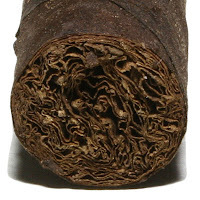 This short lancero features a blend similar to the original El Triunfador, but with a very special, very limited Connecticut Broadleaf Maduro wrapper. Made by Pete Johnson exclusively for John Ohm’s J&J Cigars in Seattle’s SODO district, it measures 6 inches by 38 ring gauge. The size itself was specifically requested by John as being a favorite of his and clearly this cigar’s existence serves as a visible tribute to Pete and John’s long friendship. Following Cigar Aficionado's 4-part rating system (Appearance & Construction, Flavor, Smoking Characteristics, and Overall Impression) we relaxed in comfort following our lengthy, heavy meal. We can’t say enough about the enjoyment of gathering inside The Vertigo Club on a cold, rainy night in Seattle. The superior craftsmanship of this beautiful cigar is the handy work of none other than Don Pepin Garcia’s My Father Cigars factory in Esteli, Nicaragua. Most of our cigars were flawless. The attractive pigtail cap is such an eye-catcher, as is the toothy, dark CBM wrapper which has an inviting, sweet aroma. The wrapper had us further mystified when we noticed a glitter to it, when held under the right light. We surmised this to be the very secretion and subsequent crystallization of the leaf’s oils that marks the beginning of plume formation. Once cut and lit, it didn’t take long for us to take note of the significant smoke output of this slender 38 ring gage cigar. In fact, these Corona Especials are great performers all the way around. The draw was superb on each and every one we had that night. The ash held pretty long for such a small ring as well. Burns were very even, though a few of us did need a relight or two toward the end of the 2nd third. 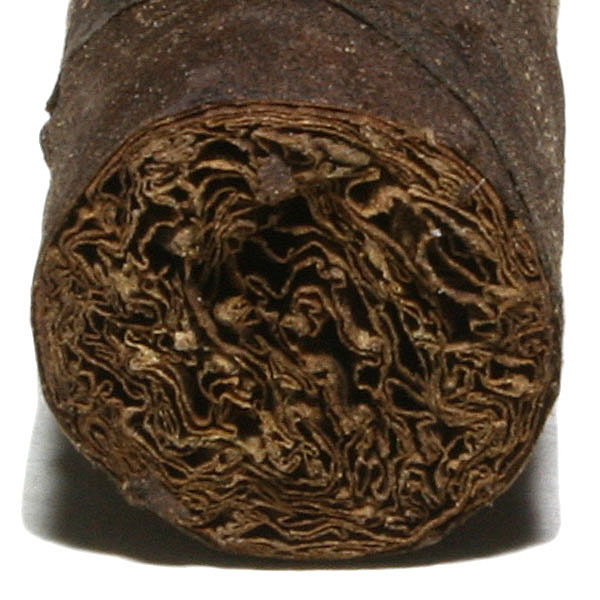 The flavors of this cigar are not all that intense, even somewhat subtle. One could certainly think of this as the lighter side of Tatuaje. The beginning is moderately bold with a wonderful espresso-like character for some, and cocoa for others in our group. Going forward, the smoothness was striking. The middle portion of the cigar was so easy going that we really found ourselves having to pay close attention to the subtle flavor changes. The final third offered the occasional meaty sensation balanced by a floral offset. The culmination left us with such a pleasant aftertaste of black tea, which was so clearly detectable, that several of us commented on it repeatedly. After throwing out the highest and lowest, then averaging the remaining scores, The Cohiba Club's official rating for the Tatuaje El Triunfador SODO Corona Especial is 92. An outstanding cigar! While certainly not a powerhouse, there’s plenty to like in this limited edition cigar, for everyone. What a shame only 200 boxes were made. 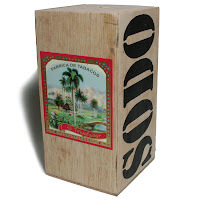 Our six tasters rated the Tatuaje SODO so high, it now proudly holds a place in our top ten favorite cigars (as seen in the sidebar to the right). What a treat to enjoy this fine cigar in the company of friends amidst the luxury of The Vertigo Club. An evening we’ll not soon forget. Also, see the very thorough review by our friend Herman of 10-7ha. See you at the next herf, January 2nd. --16dec10-- Finally, here's a few photos from Herf 40 at The Vertigo Club, courtesy of Cohiba Club co-founder Robert.